As the United States Marine band played Chanukah music, Rabbi Yossie Shemtov of Tucson waited in line with his wife, Chanie. They were about to be introduced to President George W. Bush and the first lady at a Chanukah event held in Washington last month. Handshakes are a routine part of the protocol accompanying such momentous occasions, but for the Shemtovs -- Lubavitchers and spiritual leaders of Chabad of Tucson and Congregation Young Israel -- belief and custom trump political protocol. When the Shemtovs explained to a Marine that the couple would only shake hands with persons of the same gender, the soldier seemed flustered but assured them there would be no problem, Shemtov said in a recent interview. Following the formal introductions and photo-taking session, the Shemtovs apologized to the Marine for "throwing a monkey wrench in the procedure." Much to the rabbi's pleasure, the soldier informed them that after he conveyed the Shemtovs' wishes, the first lady took the time to explain to him the Lubavitcher tradition. As Rabbi Shemtov tells this story, it's evident how pleased he was that Laura Bush was aware of the custom. It's also clear that the rabbi was impressed with what he heard during the one-hour briefing that followed the Chanukah party, particularly relating to Bush's position on Israel and his policy on faith-based initiatives. "He is totally committed to the security of everyone in Israel," Shemtov said, adding that the president made it clear he was not moving from the position articulated in the Rose Garden speech delivered in June. In that address, Bush called for a two-state solution, new Palestinian leadership and an end to support for terrorist organizations. As for the president's support for faith-based initiatives, Shemtov believes this springs from Bush's vision of charitable programs providing more "warmth" for their recipients as well as allowing more "personal freedom." This was the first time the Shemtovs met the president, and the rabbi has no idea why they were chosen to participate. "I cannot tell you. I must have been chosen from a Chabad group list. I didn't do anything special," he said. To the best of the rabbi's knowledge, he and his wife were the only Jewish leaders present from Arizona. After accepting a written invitation to the Chanukah event, Shemtov received a telephone call inviting him to participate in the briefing. Approximately 300 guests participated in the party, but the briefing, held in the Roosevelt Room of the White House, was limited to only 15 or 16 people, Shemtov said. Though representatives reflected the full spectrum of Jewish beliefs, the event was not limited to religious leaders. Members of the business and professional community also were in attendance. "I would say 50 percent of the participants were fund raisers, but I may be wrong," said Shemtov. The president had prepared remarks for the briefing, but never referred to them, according to Shemtov. "We were able to hear whatever the president says in public, but from his core beliefs," he said. Rabbi Levi Shemtov, Chabad's representative in Washington, bears certain similarities to the menorah whose lighting he engineers each year on the White House lawn: big, warm, and impossible to ignore. What makes Shemtov remarkable is that in his 12 years of dealing with the world's most powerful power brokers, few seem to consider him overbearing. "We have nothing in common except love of Judaism and love of politics -- and it's not the same Judaism and not the same politics -- but we're still very good friends," said Steve Rabinowitz, a former Clinton administration official and a longtime consultant to the Reform and Conservative movements. Shemtov's Washington profile is a clear mark of Chabad's transformation in the past three decades from an insular Chasidic sect to a player working the Jewish spectrum. Shemtov has parlayed goodwill into a powerful voice for Chabad's interests -- not all of which meet universal Jewish approval -- especially in lobbying for Chabad's entry in force into vulnerable Jewish communities in Europe and Asia. Shemtov has assiduously cultivated Washington-based diplomats from those regions. A Washington ambassadorship often is a stepping stone to a top job at the Foreign Ministry in the diplomats' home countries, so the ties Shemtov cultivates translate into greater influence for Chabad abroad. At one recent event Shemtov hosted, a U.S. diplomat whispered to a German newcomer in Washington's diplomatic corps, "Do you know Rabbi Shemtov?" "No," said the German, "but I intend to." The American nodded. "Rabbi Shemtov knows everyone." It's not an advantage that Shemtov's competitors enjoy, but at least in Washington, they cede the territory to him. In the former Soviet Union, Chabad has "a presence on the ground in a way that no one else does," said one lobbyist who works the same officials as Shemtov. Mark Levin, the executive director for NCSJ, a group that works on behalf of all the Jewish streams in the FSU, says Shemtov's advocacy has never rubbed him the wrong way. "I don't know anyone who doesn't like him," Levin said. A measure of Shemtov's popularity is the on-the-record praise from the American Israel Public Affairs Committee, the huge pro-Israel lobby. "Rabbi Levi Shemtov is a Washington institution," AIPAC Executive Director Howard Kohr told JTA. "At the White House, on Capitol Hill and throughout the Jewish and political communities, Rabbi Shemtov is a constant and valuable presence." Calling a 37-year-old an institution may seem extraordinary. Shemtov's influence derives not from promises of votes or cash, but from an unerring instinct about whom to cultivate. Shemtov inherited the job from his father Abraham, the movement's Philadelphia-based envoy to Washington during the Reagan administration. Levi Shemtov established the Washington office, called the American Friends of Lubavitch. Domestically, Shemtov's influence means Chabad assumes a higher profile than its tiny fraction of the American Jewish population would warrant: Chabad rabbis are fixtures at meetings with President Bush, and though many Jews did charitable work in New Orleans during the past hurricane season, Chabad was one of the few to earn a presidential mention for it. "One of those rescued from New Orleans put it this way: In the days after Katrina hit, 'Chabad saved lives,' " Bush told the Republican Jewish Coalition at its 20th anniversary event. Big, bearded, and in Chabad's black uniform, Shemtov is the most visible Jewish presence at non-Jewish events, from the presidential inauguration to the crowded little meet-and-greets that are a staple of Washington life. "He is an extremely able and effective advocate who knows how to get things done on Capitol Hill and throughout Washington," Rep. Steny Hoyer (D-Md. ), the Democratic whip, told JTA. The exigencies of Washington have forced Shemtov to embrace even those with differing worldviews. One week he appears at a get-together for Jewish Democrats; the next he's helping to prep an event for the RJC. "I hang out at the intersection of Jewish life and the public square," Shemtov told JTA "Most of the Jewish community doesn't affiliate with anybody." That's inevitable in a town where most folks have come from someplace else and are planning to stay only a few years. "Most Chabad emissaries have their territory defined geographically," said Nathan Diament, who heads the Orthodox Union office in Washington. "Levi exists more on a virtual geography." Chabad's office -- Shemtov calls it Chabad's embassy, and the building even has its own flag -- is on busy Dupont Circle. Shemtov realizes some worshippers drive or take the subway for holiday and Shabbat services, but he doesn't ask questions. "While I wouldn't compromise on what Yiddishkeit is, I believe there needs to be an opening to wherever people are in their lives," he said. Other attempts to organize Washington's transient political Jewish community have fallen by the wayside, Rabinowitz said. "While they should be getting it from others more in the mainstream, the fact is they're not -- and at least they're getting it from him," he said. Shemtov is close to Ari Fleischer, the former White House spokesman, though Shemtov was disturbed when Fleischer married a non-Jewish woman in 2002. That didn't stop Fleischer from including Chabad as a part of an "Axis of Good" in subsequent speeches. Shemtov insists his primary concern is outreach to local Jews, but it's clear he plays an important role in raising Chabad's profile internationally. He and the German ambassador co-hosted a commemoration this month of 60 years of Germany's post-Holocaust Jewish community. Shemtov's highest profile event is still the Menorah lighting on the White House lawn. It's a brazen mark of influence, especially as the menorah lighting claims to speak for an American Jewish community that traditionally has been uncomfortable with displays of belief on public land. "My dream is that Jews from various influences and affiliations might find a more common language," he said. "The biblical Menorah, with all its branches, was hewn from one piece." The influence of the Chabad Lubavitch movement in the Jewish world has greatly increased over the past decades. The seventh Rebbe, Menachem Mendel Schneerson (1902-1994), who died without a successor - and is considered by part of the Chabad Hasidim as the Messiah (Moshiach false Christ) - was in the 1950s at the origins of the present international outreach campaign. The willingness of a substantial number of Chabad Hasidim to travel and live in places with few or no other Orthodox Jews has been a decisive factor in the movement's success. Chabad has brought Hasidism and Orthodox Jewish practice into the public square and also into the mainstream consciousness of world Jewry. Chabad zeroes in on crucial areas in the life cycle, including childcare centers, nursery schools, and college campuses, as well as public practice of Judaism, particularly Chanukah candle-lighting but also Sabbath candle-lighting for women and the donning of tefillin (phylacteries) by adult men. Chabad's messianic (Moshiach ben Satan) approach has come under severe criticism. Yet as more established groups of Orthodoxy feel insecure and do not have adherents willing to dedicate their lives to missionary activity, they are reluctant to alienate Chabad on which they may depend in certain locations and situations. The influence of the Chabad Lubavitch movement in the Jewish world has greatly increased over the past decades. Samuel Heilman, Harold Proshansky Chair in Jewish Studies at the Graduate Center and Distinguished Professor of Sociology at Queens College of the City University of New York, says that the willingness of a substantial number of Chabad Hasidim to travel and live in places with few or no other Orthodox Jews has been the decisive factor in the movement's success. "Other Hasidim do not do this as they are not willing to live in communities with mainly Reform or assimilated Jews. They particularly fear that their children will move away from their convictions in such an environment." Heilman recalls asking in 1999 the Chabad emissary or shaliach, Rabbi Shalom Greenberg, why he settled in Shanghai. He replied that he came from a family of shluchim. His sisters, brothers, and he had a contest as to which of them would succeed in the farthest place. One of them wound up in Odessa, another in Anchorage, Alaska, and he went to Shanghai. "In 2002 when I visited Shanghai again, it had been transformed into a new Chinese Hong Kong. In 1999 there was no minyan [prayer quorum]. In 2002 Chabad already had many people visiting its facilities as a substantial number of Jews were doing business in the town. Over a few years Greenberg had succeeded in building up a Jewish community." "While other Hasidic groups grow only through their high fertility, Chabad increases also through persuasion. This carries a risk. When a Hasidic group imports outsiders, they do not leave behind all they were before. They bring new cultural elements into the group. One finds, for instance, art in Chabad environments, a rather uncommon phenomenon among Hasidim. Chabad Hasidim - also due to the environment they live in - must have a certain level of tolerance toward nonobservance. They usually also have friends who are non-Orthodox Jews." Heilman has written that Chabad Hasidim are Jewish fundamentalists for whom the Redemption can be hastened by acts of Jewish ritual activity. For them, Judaism is boiled down "to the practice of a set of ritual acts - lighting Sabbath candles, donning phylacteries, giving charity, and so forth - whose performance by all Jews - and in some cases also by non-Jews - will hasten the day of the Messiah's (Their False Christ Moshiach) return and hence the Redemption. Heilman considers Chabad structurally different from most other Hasidic groups, because it has always been on the move and from the start was not limited geographically. "The fifth Lubavitch rebbe Sholom Dovber, the Rebbe Rashab (1860-1920), his only son, the sixth rebbe Yosef Yitzhak Schneersohn, the Rebbe Rayatz (1880-1950), and his son-in-law Menachem Mendel Schneerson (1902-1994) the seventh rebbe, moved partly because they were being chased. The destruction of European Jewry in the Shoah and Communism in the Soviet Union had a major impact on the movement. Chabad was forced to abandon its East European roots and became based in the United States. "The Rebbe Rashab made the most revolutionary changes in the Chabad approach. He had to confront the Reform movement and became what one would call a 'resistor.' He saw it as his mission to oppose acculturation, enlightenment, assimilation, and the transformation of Jewry. In this process he also started the messianic character of Chabad. "When the Rebbe Rayatz came definitively to New York, he was already a very weakened man. As he had only daughters, one of his sons-in-law had to succeed him. The choice fell on Menachem Mendel Schneerson, who had lived in Paris and Berlin. He had an education in engineering and thus besides Jewish also secular knowledge. The seventh Rebbe realized that the movement required a different, more expansionist policy, which became known as ufaratsta ('You will expand'). "Rabbi Schneerson, who died without a successor - and is considered by many Chabad Hasidim as the Messiah - was in the 1950s at the origins of the major international outreach campaign. It brought Hasidic emissaries to main streets, malls, and airports as a strategy to combat assimilation. The movement used military imagery, referring to its outreach vehicles as 'mitzvah tanks' and to the youth movement as Tzivos Hashem (the Army of God). This strategy turned Chabad into a missionary movement among American Jews and abroad. In this way Hasidism, once a mass movement but after World War II far more obscure and marginal, was brought again into the mainstream consciousness of world Jewry." Heilman points out that despite the major media attention Chabad obtains, due to its worldwide activities and presence in far-flung places, it is not a large movement. "There are probably more Satmar Hasidim in the United States than Chabad adherents. Dan:11:23: And after the league made with him he shall work deceitfully: for he shall come up, and shall become strong with a small people. "In Crown Heights in Brooklyn there are ten to twelve thousand Chabad Hasidim. Another seven thousand live in the village of Kfar Chabad in Israel. Beyond that numbers become a question of both guessing and definitions. "One can assume that there are about three thousand Chabad shluchim. They together with their wives and their numerous children may account for another twenty thousand Hasidim. That brings the estimated number up to forty thousand. In a town with a Chabad house, there may be two shluchim and their families. If fifty people visit it frequently, are they all Orthodox? Should one count them as Chabad Hasidim? Not necessarily, yet many of them are attached to Chabad. "When Rabbi Chaim Mordechai Aizik Hodakov, late chief of staff of the office of Rabbi Menachem Schneerson, was asked how many Chabad Hasidim there were, he reportedly replied: 'How many Jews are there in the world?' This answer expressed the concept that potentially all Jews are Chabad Hasidim." "Chabad Hasidim are not only characterized by their frequent willingness to leave their heartland but also by their missionary messianic fervor." Heilman observes: "Like all missionaries, even when they succeed, they are also transformed by their surroundings. One cannot be extremely ultra-Orthodox when one doesn't have an ultra-Orthodox minyan to attend. When they cannot start a school for their own children they have to send them for education elsewhere. "A crucial element in Chabad's success is the movement's willingness to fill vacuums - for instance, in a community that cannot find any other suitable rabbi. Chabad, driven by its ideology and religious fervor, will typically be willing to provide a candidate for such a position. "That often also means that the community gets a rabbi at a lower salary than the going rate. When appointing a Chabad rabbi one has to accept his ideology. The mode of prayer has to be Orthodox. His projects will have to be supported financially. The community will have to have certain institutions such as a mikveh [ritual bath] and some kind of school. It will have to move more toward Orthodoxy even if only some of its members will become more religiously observant. "The Chabad rabbi's influence varies between communities. In Russia, for instance, it is extraordinary. Rabbi Berel Lazar, the Chabad Chief Rabbi in Moscow, has the ostensible support of President Vladimir Putin. In Russia, Chabad attracts certain people by giving them free food and education." Sometimes the vacuum a Chabad shaliach decides to fill is identified only by him. Heilman gives an example from his personal experience. "There is a very pleasant Chabad Hasid named Hirsch Zarchi who started out proposing to Jewish passersby to put on tefillin [phylacteries] in Harvard Square at the university. He became the Rebbe's shaliach in the town. In the 1990s he set up a very successful Chabad house at Harvard. "When one of my sons graduated at Harvard, Zarchi marched in the academic procession." Heilman remarks: "Which other Hasidic rabbi would march in an academic procession? Here is a person without academic credentials who never went to college. Yet being at Harvard and able to interact with and impress some of the most intelligent and challenging students in America, he must deal with enormous intellectual and religious challenges. "Zarchi and other Chabad rabbis like him and their wives are committed for life to a certain location. Their aim is to draw Jews to Orthodoxy. As far as non-Jews are concerned, they have a campaign called Seven for Seventy, trying to convince them to follow the seven Noahide commandments. "Chabad shluchim do not aim to convert non-Jews to Judaism but some people are so much attracted that they do. A fellow student of my son at Harvard had a Sikh father. His mother was raised as a Catholic in Costa Rica, though she may have been of crypto-Jewish origin. He was attracted by both the general Jewish-student house of Hillel and by Chabad. He didn't convert at Harvard. Recently, however, I met him in Washington, DC, in a synagogue and learned that after some time in an Israeli yeshiva, he had converted to Judaism." When asked how the Chabad system functions, Heilman replies: "Though there is a central body, the Merkos L'Inyonei Chinuch, in essence each Chabad shaliach has a territory. Another Chabad rabbi can only come to live in an area if he gets the agreement of the rabbi already there. Candidates often go to the grave of the last Rebbe asking for his agreement. They often find an answer by opening a volume of his letters at random and looking for a line on the page that will indicate approval or disapproval of the plans. "Rabbi Yehuda Krinsky, the secretary of the late Rebbe and administrator of worldwide Lubavitch, is also often asked what location is available. The decision where to locate his activity is, however, largely the Chabad shaliach's own. "At Queens College where I teach, a Chabad shaliach arrived for the first time in 2004. The college has a very active Hillel organization and is connected to the major Jewish community in the borough of Queens. This shaliach became the self-appointed Chabad rabbi of Queens College. His modus operandi is that he comes to the kosher cafeteria and offers classes. He meets with professors and tries to find financial supporters in the community. Slowly he builds activities. He will either swim or sink. "My brother-in-law is the Hillel rabbi at Tufts University. I told him not to worry when the Chabad shaliach arrived, saying that he was not a competitor. I considered that the students he will reach are not the ones Hillel does and said: 'If he arouses interest in Jewish life, the only institution that they have to go to is yours. In a way, his success will redound to your success as well.' Indeed Chabad has not hurt Hillel in any way." Heilman says that a shaliach who fails to build an activity would have to find somewhere else to go or something else to do. "It would be a very interesting research project to trace a newly-arriving Chabad rabbi from the beginning and follow his trajectory. Every case is unique. It is difficult to draw conclusions about the success or failure factors because they may greatly vary. As far as universities go probably a major role is being played by whether it is a community college or a residential one, the nature of the student community, and how receptive the local Hillel rabbi is. Another major factor everywhere is the qualities of the shaliach's wife." "Chabad has some specific marketing tools. Chanukah is a very important holiday for them. They set up a menorah in a public location or light candles in a nursery school. These activities attract people. The shaliach may become a member of a synagogue and use it to recruit followers. He may offer free teaching, a class here and there. A synagogue that does not have any activities in the middle of the week often wonders what it could lose by accepting such an offer." Another marketing tool, Heilman observes, is that Chabad has created a successful media image in Washington. "Rabbi Abraham Shemtov has been the Rebbe's 'ambassador" to the White House for many years. He used to have a Torah study group in the Senate with then Minnesota senator Rudy Boschwitz, who supported the Chabad movement. There are pictures on the web of each U.S. president since Jimmy Carter in the Oval Office together with several Chabad rabbis. Shemtov got a medal from Congress for the Seventh Lubavitcher Rebbe. On Chanukah 2004, Chabad kids and rabbis and families lit candles with President George W. Bush in the Oval Office." When asked why other, larger Jewish organizations do not achieve the same, Heilman replies: "Many are not interested, nor do they have emissaries fired by the same religious fervor." Heilman explains why Chabad succeeds in obtaining funding from unaffiliated Jews. "Some feel unloved. Rich people can feel lonely too. They encounter in the Chabad shaliach somebody who is not looking for a stock tip or something like that. "Chabad shluchim give people a feeling that they care about them. Chabad is able to convey a sense of Jewish authenticity to people without demanding a total transformation of those they talk to. It is enough for them if somebody declares 'I'm Jewish.' They will help him don tefillin even if he says: 'I'm not going to do it again.' Sometimes this approach, much of which is face-to-face, works very well. "Chabad shluchim know that they will have to fundraise. Initially a shaliach may be supported by his parents or in-laws. He may get a small subsidy from the head office. That is an incentive to do well. The smart ones will learn fundraising techniques. "Some get more formal training than others. There is, however, no evidence that those with formal training succeed more than others. The emissaries also have international meetings where they learn from each other. The outcome of any missionary activity depends very much on what one has to sell and how one does so. The Chabad product is very saleable to certain types of Jews." Heilman points out that one might divide Chabad Hasidim into messianists (Son of Perditionist) and nonmessianists. "The main Chabad building at 770 Eastern Parkway in Crown Heights, where the last Rebbe lived, is now in the hands of the messianists, who call it Beit Moshiach [the Messiah's House]. When the Chabad shluchim - who are much less messianist since active messianism does not 'sell that well' in the provinces - gather in Brooklyn they meet elsewhere, most recently at the Marriott Hotel. "A certain reversal has taken place in the movement. Crown Heights was its heart as long as the Rebbe was alive. Everything else was peripheral. Now the Chabad adherents in Crown Heights have little to do. They are often obsessed with messianism, missing the Rebbe as a core tying them together. They have replaced him with messianic longing. Many are Israelis, who go back and forth to New York while waiting for the Messiah. They do so with remarkable intensity and enthusiasm but the essence of their activity is waiting." Heilman notes that these Chabad Hasidim are not the only messianists in the Jewish world. "Part of the Israeli settlers in the West Bank and formerly in Gaza are also messianists; some believed that the Messiah would come before the disengagement in Gaza. "There is a confluence of worldview and some other similarities between the two groups and it is not incidental that the Chabad movement has been working among the messianist settlers. From Chabad's standpoint, if these settlers consider that the Messiah's coming is imminent they could believe that he is their Seventh Rebbe. If part of the settlers say that this is the Messiah's time, and to accelerate his coming one has to settle the Land of Israel, Chabad can take a free ride on that messianic element. "In some ways, the death of the Rebbe has opened new avenues for Chabad. In the past there was the problem that their leader, whom many of them considered the Messiah, had not come to Israel. After his death the Rebbe has become 'movable.' Chabad Hasidim built a replica of his Crown Heights house in Kfar Chabad. Similar replicas are being built elsewhere. In this way their Messiah can be or come everywhere. "In many cults in which prophecies are not realized, many followers, instead of giving up, become more energetic. They claim that the failure was a test to be passed in order to generate more believers. The Chabad movement became even more adamant after the Rebbe died. "There are claims that the Rebbe foresaw all this and through the idea of establishing Chabad houses and sending shluchim has created a franchise. Now every local Chabad rabbi becomes an intermediary between the people around him, the Rebbe, and God." Criticism "The messianic approach of Chabad has come under severe criticism. One major critic is Professor David Berger of Brooklyn College and Yeshiva University.2 He takes Orthodoxy to task because they tolerate Chabad while in his view its version of messianism is Christological. Berger will not eat food that is prepared under Chabad supervision because he considers that any group that believes that there ever was a Messiah has crossed the red line of what is acceptable to Judaism." Heilman says: "To a certain extent Orthodox Jews rely on Chabad because they have no choice. If one wants to attend an Orthodox service in far-flung places such as Kathmandu, Shanghai, or Beijing, there is only Chabad. Nobody else wanted to go to these towns to create services. This Chabad presence everywhere would have been Menachem Mendel Schneerson's main legacy, had there not been his false messianism." "The more established Orthodox groups do not have people willing to dedicate their lives to missionary activity. Their adherents do not wish to spend years of their lives when they are just married going out and trying to make nonaffiliated Jews more affiliated and involved. "There are some other groups who undertake outreach such as the Breslov Hasidim but they are fewer and far less organized than Chabad. Their emphasis is on the spiritual rather than the concrete. They also make more demands than Chabad on those they try to attract. Yet they have some success too. The Kabbalah movement also attracts nonreligious Jews. But Chabad is much closer to standard Orthodoxy apart from its messianism." "Chabad is changing continuously. Its move into the campuses was a relatively small one. The media report that from 2001 to summer 2005 thirty new Chabad houses had opened on American campuses, with another ten planned for the coming school year.3 On campus Judaism is weakest and that is where they are most likely to have success. Most general outreach programs, for instance, Birthright, one that brings college students to Israel, aim at kids post-high school. Chabad is present in the colleges themselves, which is very important. It is there that one establishes relationships, when marriages begin, and one begins to think about creating one's own family. "Chabad is also present in the childcare centers and nursery schools. They are zeroing in on crucial points of the Jewish life cycle. And they're there when people are traveling, starting from the airports. The biggest Passover seder in the world is probably the one Chabad has in Kathmandu." Note : I do not share the Racist belief of this person. President Bush is risking a backlash that could injure the Jewish community — and his own cause — by repeatedly citing Israel as his top rationale for possible U.S. military conflict with Iran, Jewish leaders and Middle East analysts warned this week. Bush’s repeated, sometimes exclusive, focus on Israel could spark public fury against the Jewish state and Jews if U.S. military action is accompanied by skyrocketing gas prices, terrorism at home or fallen G.I.’s who might be seen as dying for Israel, some said. 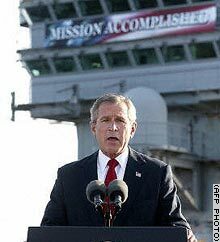 Others feared it could fracture the shaky international coalition Bush is striving to assemble to oppose Iran’s nuclear program by framing the threat as primarily to Israel rather than international stability. Of course, the entire plan for an Iran War is about Israel and not the United States. Israel is behind it, the Neocons (Talmudic jews and their Noahide proselytes) are behind it, and the Jewish extremists that have such disproportionate influence in the media are behind it. 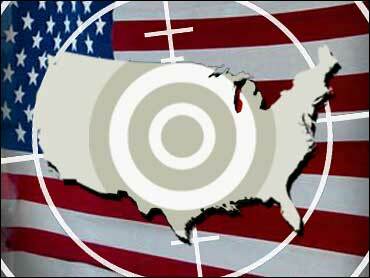 A war with Iran would be an unmitigated disaster for the United States. It would raise the specter of massive terrorism against Americans all over the world, cost a huge treasure of American funds, cost thousands of innocent lives of both Americans and Iranians, and perhaps even drive the world to economic disaster. While Jewish individuals and organized groups alike wage relentless war on the public celebration of Christmas, ostentatious displays of Jewish symbols are not only permitted, but the obvious hypocrisy is barely, if ever, even commented upon. In the latest outrage, a massive menorah was erected on the lawn of the White House to celebrate Chanukah (various spellings), a Jewish "festival of lights" that was only a minor holiday until fairly recent Jewish campaigns to neutralize Christmas and other European-American celebrations. According to reports, the religious candelabra lighting was honored with a military color guard. Chabad is part of the Lubavitch school of Hasidism, whose late leader, Mendel Schneerson, was revered as akin to a prophet. Some Lubavitchers are convinced that he was in fact the Messiah. Unlike many Hasidim, the Lubavitchers are hard-core Zionists (Anti zion, anti Aholibah, secular zion, Judah) and are intent on publicly touting Jewish interests. According to reports, Chabad will be erecting Chanukah candelabras in public spaces world-wide. The campaign has provoked some resistance in Jewish circles, fearful of setting precedents for religious expressions in public, and wary of drawing Gentile attention to the grotesque double standard, but the resistance has been declining. The menorah is not the only inroad Judaism as a religion (as opposed to politically) has made presidentially. In California, the Chabad will host a spectacle the day after Christmas at the Ronald Reagan Library, named “The Triumph of Freedom: Chanukah at the Reagan Presidential Library.” Chabad's soiree will include "a magical bird show, the building of a Lego menorah...and guest dignitaries." Naturally, "patriotic songs" and donuts will also be provided. Back at the White House, Jewish neo-con (Talmudic) policy-makers in the Oval Office have been joined by kosher chefs in the (taxpayer-funded) kitchen. In mid-December (2005) the first "kosherization" of the White House kitchen took place, involving a rabbi muttering incantations, prior to the annual Chanukah White House dinner. 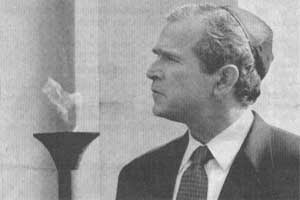 At the dinner celebration, President Bush lit religious candles and linked the holiday to his Zionist-inspired war on Iraq. Chanukah is a remembrance of a supposed Jewish uprising against Antiochus IV Epiphanes, a Greek King hated for his civilizing influence, still denounced by radical Zionists as "Hellenization." There are those worthless souls who ignore the power of 666; who believe Tuesday- June 6, 2006 - is nothing more than another ordinary mark on the ordinary calendar. They will go about their lives, blind to the blood-curdling evil all around. Soon, the streets will fill with death and decay. Soon, scalped chickens will fall from the sky. Soon, the anti-Christ will rise to render the earth a mosh pit of despair; an empty, rotted stink hole of evil mayhem brought about by all things satanic. Doom will reign! Faces will melt! Alan Thicke will star in a new sitcom! The world will explode! Die! Die! Die! Yes, the date is June 6, 2006. And yes, there is a movie remake, "The Omen," that debuts Tuesday and focuses on the idea that 6/6/06 marks the rise of the anti-Christ. And yes, a couple of people even believe it. (According to a report by Tony Allen-Mills of Britain's The Sunday Times, a pregnant Englishwoman recently urged her doctor to do everything within his power to push up her June 6 due date.) "But I think I can assure you we're safe," says Fred Berardi, a monsignor with the Holy Family Church in New Rochelle. "Nobody needs to hide under their furniture." Indeed, while "The Omen's" opening scene features members of the Vatican gloomily preparing for the June 6 arrival of the anti-Christ (in this case, a googly-eyed kid named Damien), few within the real Vatican appear to be losing much sleep. There have been no public warnings; no cries from Pope Benedict to load up on canned goods. And yet, a legitimate biblical tie between 666 and bad stuff seems to exist. As reads Revelation 13:16-18: "He also forced everyone, small and great, rich and poor, free and slave, to receive a mark on his right hand or on his forehead, so that no one could buy or sell unless he had the mark, which is the name of the beast or the number of his name. This calls for wisdom. If anyone has insight, let him calculate the number of the beast, for it is man's number. His number is 666." By "the beast," is the Bible referring to a three-headed, red-eyed ogre? Unlikely. Instead, most scholars interpret 666 to be the numerical code for Nero, the fifth Roman Emperor (54-68 AD) of the Julio-Claudian dynasty, who ruthlessly persecuted Christians. "The legend of the anti-Christ is that of an agent of Satan empowered to pave the way for the end of times," says Phil Stevens, a professor of anthropology at University at Buffalo and an expert on religious symbolism. "The myth of the anti-Christ has been passed down through the generations. But to start with, it appeared to be simply a very disliked man." Time heals all reason. With the passing of decades, a growing number of loons, uh, writers have come to accept 666 as a flashing neon YOU WILL PERISH! alert. In his 1988 book, "Gorbachev! Has the Real Antichrist Come?," author Robert W. Faid makes the case that the former Soviet Union head is here to ruin everything. "If indeed the antichrist is the leader of the Soviet Union," writes Faid, "then the mark may well be the Red Star - the universal Communist symbol." In his 1993 book, "How Close Are We?," Dave Hunt argues that the anti-Christ will arrive with the number 666 imprinted on a computer chip under his skin. And on the 666-centric Web site, www.av1611.org, the national health care card pitched by former president Bill Clinton is offered as proof of the anti-Christ. "A sinister plan is being carefully carried out by an unseen but very real hand!" warns the site. "Make no mistake about it - 666 is coming." For the record, we've gone through this before. The concept of a heinous 666 received a nice jolt in the year 1666, when the Great Fire of London killed thousands and left more than 100,000 people without homes. Unfortunately for panic's sake, there's little else to work with. Our last 6/6/06 came 100 years ago, and though June 6, 1906 surely brought its fair share of deaths, brushfires and bad theater, it offers but one sinister moment. That afternoon at Chicago's Wrigley Field, pitcher Jack Harper was nailed on the right hand by a line drive off the bat of Giants outfielder Don McGann. Once a promising up-and-comer, Harper was removed from the field, never to appear in another major-league game again. The work of the devil? Of evil? Of a ruthless anti-Christ? Maybe, maybe not. Who can do battle against the beast? The technology was demonstrated in spectacular fashion three years ago when Austrian daredevil Felix Baumgartner - a pioneer of freefall gliding - famously 'flew' across the English Channel, leaping out of an aircraft 30,000ft above Dover and landing safely near Calais 12 minutes later. Wearing an aerodynamic suit, and with a 6ft wide wing strapped to his back, he soared across the sea at 220mph, moving six feet forward through the air for every one foot he fell vertically - and opened his parachute 1,000ft above the ground before landing safely. Now military scientists have realised the massive potential for secret military missions. Currently special forces such as the SAS rely on a variety of parachute techniques to land behind enemy lines - or else they must be dropped by helicopter. Existing steerable square parachutes can be used - opened at high altitude of 27,000 ft - but jumpers then have to struggle to control them for long periods, often in high winds and extreme cold, while breathing from an oxygen tank to stay alive. Alternatively they can freefall from high altitude, opening their parachutes at the last possible minute, but that limits the distance they can 'glide' forward from the drop point to just a few miles. Now German company ESG has developed the strap-on rigid wing specifically for special forces use. Resembling a 6ft-wide pair of aircraft wings, the devices should allow a parachutist to glide up to 120miles, carrying 200lb of equipment, the manufacturers claim. The manufacturers claim the ESG wing is '100 per cent silent' and 'extremely difficult' to track using radar. Once close to their target landing zone, the troops pull their parachute rip cord to open their canopy and then land normally. Weapons, ammunition, food and water can all be stowed inside the wing, although concealing the 6ft wings after landing could prove harder than burying a traditional parachute. ESG claims the next stage of development will be fitting 'small turbo-jet drives' to the wings to extend range even further. According to SAS insiders, very few operational parachute jumps have taken place in recent years, with teams tending to rely more on helicopters or other means of transport. Supporters of the new mono-wing technology hope it will give a new lease of life to parachute tactics in the special forces world. The Ministry of Defence would not comment on any equipment used by special forces, but is expected to evaluate the new system for use by UK special forces. "These individuals are often hiding in plain sight in cities like Torrance and now Toledo." (CBS) U.S. officials believe Canadian arrests over the weekend and three recent domestic incidents in the United States are evidence the U.S. will soon be hit again by a terrorist attack. Privately, they say, they'd be surprised if it didn't come by the end of the year, reports CBS News correspondent Jim Stewart in a CBS News exclusive. A state of emergency has been declared in Gaza, as fighting between Hamas and Fatah gunmen continues to claim victims. The latest victim: a Hamas military official killed by a bomb in his home. Officials have instructed medical aid workers to wear protective vests, in light of the feared escalation in fighting. The latest killing, around 11:00 this morning (Monday), was originally reported to be the result of a bomb placed by Fatah men in a Hamas official's home. Later reports, however, stated the bomb might have been one the victim himself was working on. Among the dead in last night's fighting were the brother and 20-year-old pregnant wife of a Hamas terrorist; the targeted Hamas man is himself listed in very critical condition. The incident occurred in Khan Yunis, adjacent to what used to be N'vei Dekalim in southern Gush Katif. Elsewhere, at a mourners' tent for a Fatah police officer in Gaza City, shots rang out and killed at least two mourners. The victims, like the officer, were Fatah men who were killed by Hamas gunmen. In a third reported incident, a Hamas operative was killed as he was shot while driving in Gaza City. Later in the day, militants took over and damaged a Fatah TV station. A Hamas spokesman denied that his organization was involved. Tensions were expected to abate yesterday, following the beginning of the payment of salaries to the more than 150,000 Palestinian Authority employees for the first time in three months. The salaries are being funded by interest-free loans granted the PA by local banks. However, the payments did not go smoothly today, and dozens of angry Arabs who were not paid rioted inside at least two bank offices, leading to their closure. Agitation may also increase as the leaders of Fatah and Hamas find themselves unable to reach an agreement on the issues of dispute between them. PA Chairman Mahmoud Abbas (Abu Mazen) says that if Hamas does not accept, by tonight, the paper known as the Prisoners' Document, he will call a referendum tomorrow. Hamas leader Ismail Haniye, however, who serves as prime minister in the Palestinian Authority, says that the people already said their piece in the January elections. He refuses to either recognize the Prisoner's Document or to agree to a referendum. The document in question recognizes Israel's pre-1967 borders, calls for an Arab state in all of Judea, Samaria and Gaza, and formulates guidelines for understandings between Hamas and Fatah. Hamas objects to the clauses that call for adopting international resolutions to end the Israeli-Palestinian conflict and considering the PLO as the sole legitimate representative of the PA's Arabs. Yesterday (Sunday), Abbas refused to talk by phone with Haniye, and sent two representatives to speak with him instead. Haniye said he had no time to talk with them. Another attempt at a meeting between Haniye and Abbas' representatives will be made today. Three Arabs were injured yesterday in southern Gaza when a political argument deteriorated into a shootout between Fatah and Hamas gunmen. At least 400 of the bodies could not be identified and will be buried by the government in three weeks if they are not claimed, the official said. If this monthly death rate continues, 2006 would exceed last year -- with some 10,150 bodies received by the morgue -- as the deadliest year in the capital since the war began. Iraqi police found nine heads Tuesday along a highway in Hadid, a town just west of Baquba about 37 miles (60 kilometers) north of Baghdad, police and hospital officials said. The heads were wrapped in black plastic bags and shoved into fruit boxes, authorities said. Their identities could not be immediately confirmed. It was the second such discovery in four days. On Saturday, eight heads were found in Hadid and also had been stuffed into fruit boxes.